• 18, 20, and 22″ Holy Grail — ten fantastic rides and crashes, all in jazz weight. Many folks have been interested in 20 and 22″ rides, but these 18″ crashes are GREAT— I encourage you to consider them. • One set of 15″ thin Holy Grail hihats. There were no 16″ hats in the new shipment , unfortunately, but these 15s are just as good. More are available— I played several equally good sets. • 20″ Mersey Beat ride— I have two currently available. • 22″ custom Turk-style ride— or “Krut”, as the smiths call it— unlathed, thin, with a low, complex sound, with good definition. • 20″ Swish. 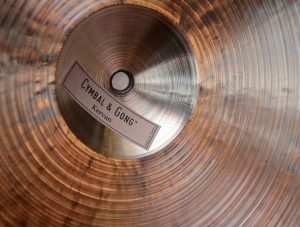 I’ve never gotten to play C&G’s Swish cymbals before, and they were very interesting, with a unique profile— larger bell and wider upturned edge than is found on most other brands. Medium-thin, available sizes from 18-24″. There was another interesting custom line, “Midnight Lamp”, with features similar to another brand’s “Anniversary” series. These were special-ordered by a dealer in California, who has first option to buy them. I think they’re very cool, and will buy them if that dealer passes. Dark, well-defined, somewhat more aggressive than the Holy Grails. Video of the selection process is coming soon, as well as audio/video of the new cymbals— check back throughout the weekend! The last shipment of the year has arrived, and we will be selecting cymbals for the December 2018 Germany tour on Friday, October 26th. The best variety of sizes/models will be available that day— email us today to make your requests! We will be meeting people and showing cymbals in Berlin (Dec. 3) and Dresden (Dec. 5)— you can order/make requests as late as November 25th. Sign up for our mailing list or check the site for full tour details.